Substantial numbers (up to 109 cells g-1) of microbial cells are detected in permafrost but vary over a large range among different permafrost environments (Table 5.1). In general, only a small proportion of the microbial community is represented by cultured isolates. In Arctic permafrost ca. 0.1-10% of the microbial community is recovered by standard culturing, while in Antarctic permafrost viable cell recovery is only 0.001-0.01% (Vorobyova et al. 1997). Microscopic investigations of permafrost microorganisms in situ have revealed the presence of partially degraded cells (i.e., ruptured cell walls and membranes) and empty "ghost cells" (Dmitriev et al. 2000; Soina et al. 2004); due to the constant subzero temperatures in permafrost, dead or compromised microbial cells may remain well preserved and contribute to total microbial counts. For example, Hansen et al. (2007) observed that 74% of the microbial community in Spitsbergen Island permafrost had compromised cell walls, based on differential staining and microscopy, and were considered non-viable. Intact microbial cells in permafrost are characterized by altered ultrastructures such as thickened cell walls and a non-homogenous cytoplasm that contains numerous aggregates (Soina et al. 1995, 2004). Perhaps most characteristically, Siberian permafrost appears to be dominated by populations of cells <1 |im in size (Dmitriev et al. 2000; Soina et al. 2004) with ultramicroforms of cells <0.4 |im in diameter making up as much as 80% of Siberian permafrost microbial populations (Vorobyova et al. 2001). Dwarfed cells are characteristic of the viable but non-culturable state (reviewed in Oliver 2005) and, therefore, many cells in permafrost may be in a physiological state that is recalcitrant to laboratory cultivation, partially explaining the low viable cell recovery. 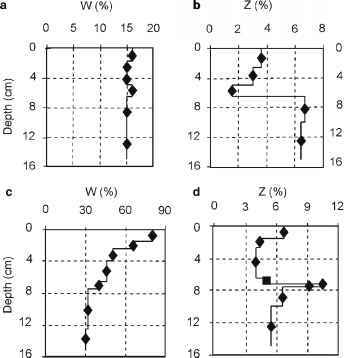 The ability to recover viable cells from permafrost seems to be independent of permafrost temperature or depth, but depends on the age of the permafrost. With increasing age, both the number and diversity of bacterial isolates decrease, with an increase in the number of sterile samples (Gilichinsky et al. 1989, 1992; Khlebnikova et al. 1990). Nevertheless, viable microbial cells were recovered from Siberian permafrost as old as 3 million years (Gilichinsky 2002a). The amount of ice in permafrost also has a large effect on cell recovery, as increasing ice content often greatly reduces viable cell counts. Viable bacteria are rarely recovered from nearly pure ice systems in permafrost such as ice wedges (Gilichinsky et al. 1995; Gilichinsky 2002b) or massive ground ice formations (Steven et al. 2008a), although viable bacterial numbers of up to 106 CFU ml-1 were recovered from an Alaskan ice wedge sample (Katayama et al. 2007). Therefore, the origin, age and physiochemical characteristics of the ice presumably determine the presence and abundance of a viable microbial community.